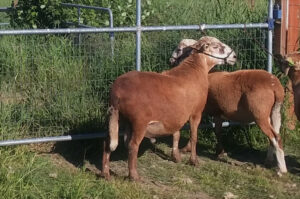 Hershey was the first ram we used, a non-NSIP ram whose only data was generated from his performance here. We bought him from Shirley Hasbrouck in Shelton, who had used him for several years prior. 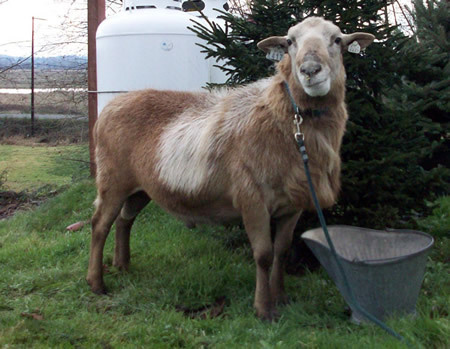 She bought him from Bert Martineau, who used to have a very large commercial flock of Katahdins in SW Washington state. Bert has since retired, so this is some of the last of his unique line of production sheep. One thing really valuable about this ram is his pedigree lacks any of the popular sires that were over-used in our region and appear in most lines (often multiple times); creating genetic bottlenecks and risk to the gene pool. 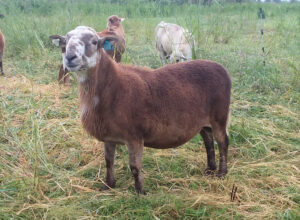 This is a very diverse, “old stock” ram who made a good outcross to line-bred ewes. Several people have intentionally chosen breeding stock out of Hershey just for that reason, to try to escape some of those frequently-used-sires, and re-establish some genetic diversity in their flocks. Hershey was a pretty red color, and was very gentle and easy to work with. He had a true “AA” coat, where no wooly fibers extended beyond the hair coat in winter. He did a great job as a sire through almost age ten, easily servicing a few dozen ewes in his “assigned group”; but was starting to show some signs of age, so we retired him at the end of 2010. He threw healthy, pretty lambs and was a good sire. We’ve kept a few different rams out of his line that improved upon his genetics via some excellent ewes. Over time, we can see that his EBVs declined, reflecting that he was really only an average/mediocre ram for production traits. But, that’s the power of EBVs, is showing us where the true performers are; I never would have been able to guess he was less strong than his peers just based on visual appraisal of his lambs and daughters. Only the numbers tell the truth! 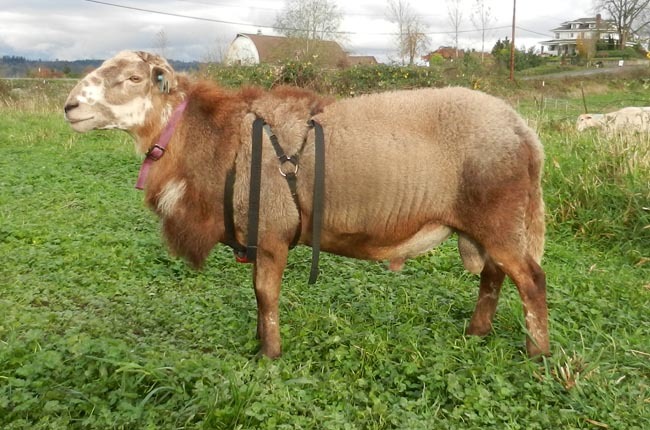 Hershey is several generations back in the pedigrees of a lot of our ewes, and one of our current rams; but every generation gets stronger with selection on ever-increasing EBVs for growth and maternal traits. I don’t regret using Hershey for the vigorous old-stock genetics he brought; and now we bring those forward into improved generations for growth and maternal traits. EBVs from up-to-date 2017 Feb lamb crop data. Pictured here as a ten year old. Rugby has very balanced EBVs that predict producing very standard Katahdin lambs that will grow well and be good producers themselves. His prolificacy scores are on the lower end, so his daughters will stay more in the single-twin range than the twin-triplet range. What I love about him is that Holy Grail I’m seeking: fast growth to butcher weight, but then slowing down into maturity, so he did not turn out to be a huge adult. He is very calm and handle-able, he’s put together well and has that flashy coloration so many people value. 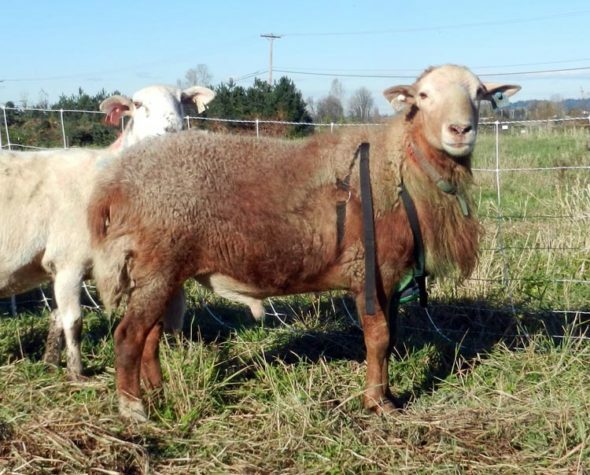 He is out of a fantastic-scoring ewe from David Coplen’s Birch Cove farm in Missouri, a grass-fed system where heavy selection pressure is placed on easy care sheep; and from a long line of NSIP-focused breeding programs. His sire was from local genetics and he produced a lot of good-growing lambs for me. EBVs from up-to-date from 2018 fall lamb crop data. Pictured here breeding as an eighteen month old. Photos at the bottom of this post were taken in May/June 2018.